Accommodations: Indochina hotel hanoi or Similar. Upon your arrival at the Noi Bai (Hanoi) airport, our local guide will pick up to hotel. The rest of the day is free to relax and recover from jetlag. Tonight having dinner at one of the finest restaurant in Hanoi. On this day we will first visit Ba Dinh Square, Ho Chi Minh complex followed by the Temple of Literature. In the afternoon we will visit Museum of Ethnology and explore Hanoi old quarter by cyclo (paddle rickshaw). In the evening we will enjoy the water puppet show. Arrive in Halong at 11:30am. 17h30 : Enjoy sunset and have dinner on board. Early risers can enjoy a morning view of Bay’s landscapes. Sitting on ther upper deck we can enjoy the breath – taking beauty of the rocky Islands rising from the crystal-clear waters of the Bay.We can hear birds singing, cicadas chirping ashore and the gentle lapping of the waves against our boat, the perfect soundtrack to accompany the fresh air & gentle breez. 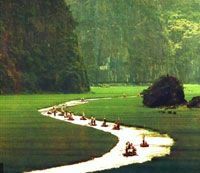 7h30 : A morning cruise to visit Man’s head island, Tortoise island, visit Luon cave by small bamboo boat, visit Bai Tu Long Bay. 11h45: Arrive Halong wharf. Drive to Hanoi. Have dinner at Restaurant in Hanoi and overnight in hanoi. Morning: Pick up at hotel and depart for Ninh Binh. Arrive in Tam Coc at around 10.00AM. Visit Hoa Lu Temple, the ancient citadel of Vietnam in 10th century. Enjoy a trek to the King Dinh’s Tomb on a terraced hillside and gaze down at the ancient capital in the beautiful Truong Yen Valley below. Have lunch at at a restaurant in Tam Coc. Board sampans at Tam Coc to ferry down the Boi River. The boat goes through 3 cavernous limestone tunnels, offering a cool break from the sunshine and astounding views of the cave structures. Accommodations: Lotus hotel or similar. We will take a dragon boat to cruise along the Perfume River. Visit Thien Mu pagoda, after that, we will take our van to visit to the majestic and scenic Emperor Tu Duc tomb. 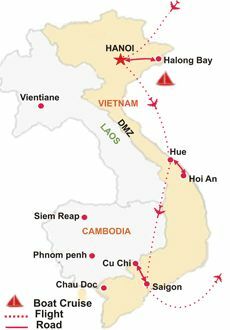 In the afternoon we depart Hue for Hoi An travel through the high pass of Hai Van with its spectacular views of the Pacific Ocean en route to Da Nang. We will visit: Cham Museum, Marble Mountain, “Chine Beach” and then going to Cua Dai Beach for our hotel. 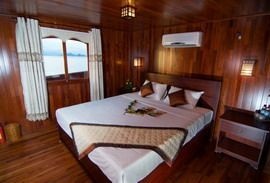 Accommodations: Que Huong Libury Hotel Saigon or similar. Today we will transfer to Da Nang airport to take the flight to Ho Chi Minh City in the early afternoon, after short flight, we will be transferred to the hotel. The rest of the day, we are at leisure. Accommodations: for 8 nights at 3 star hotels & resort, 1 night on board 1 night on bus. Note: If you like flight to Hue from Hanoi, add 50 UD$/pax. Please contact us now to obtain the best price for this great tour or inquire about a custom made tour.